In Total Football Analysis’ February magazine edition, I took the time to analyse some of the Eredivisie’s important transfer trends. While youth academy optimisation and scouting around Europe are commonplace, many Dutch teams are discovering the wonders of finding hidden gems in the Americas. Brazilian winger David Neres – hailing from football metropolis São Paolo – signed for Ajax Amsterdam two years ago. 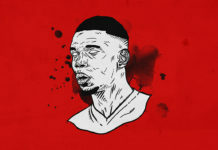 In that time, he has become one of the most sought-after attackers in the country, proving just how smart Ajax were to pay €12 million for the now 21-year-old. After a half season adjusting to life in the Dutch capital, Neres became a guarantee in Ajax’s XI for the 2017/18 season. He scored 14 league goals and created 13 assists last season in a role that saw him exclusively deployed as the right-wing threat. Neres and Justin Kluivert formed a dynamic and young duo that terrorized Dutch defences, earning Ajax Champions League qualification. Kluivert earned his move to AS Roma during the summer, but Neres remains at the Johan Cruijff ArenA. An argument could be made for Neres being Ajax’s best, or at least most productive, player last season, so it comes as a surprise that Marc Overmars was able to hold onto the promising Brazilian. 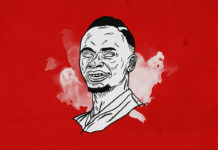 However, with Dušan Tadić’s move from Southampton and the emergence of Frenkie de Jong as a world-class creator, Ajax have shifted gears this season. Neres has only started 10 Eredivisie matches as Ten Hag often opts for Hakim Ziyech and Tadić on the wings. David Neres now has a diminished role in Amsterdam, but he has still made an impact in his second full season. Three goals and nine assists in less than one-thousand Eredivisie minutes is a remarkable feat. Neres also started in all but one Champions League group stage match, a round which saw Ajax undefeated against Bayern Munich, AEK Athens, and SL Benfica. Rumors of a move to China have emerged in recent months, but David Neres is very much an Ajax player. His contract runs until 2022 and, until then, Overmars will expect a large transfer fee for his services. De Jong has secured a move to Barcelona and many expect Matthijs de Ligt to do so next summer. If the day comes when Ziyech moves on, Neres will surely be the player to take on the mantle as Ajax’s leading talent. Until then, he is a great option for Ten Hag as a starter or an impact substitute. David Neres is a tricky player to shoehorn, and by that I mean it’s hard to tell exactly what type of player he will be in the coming years. He’s left-footed but plays often on the right side. Neres’ dribbling is exceptional: his 68% completion rate is better than last season’s 64%, which was already the best per 90 out of all Eredivisie players with more than 30 appearances according to WhoScored. His close control results in maximum ball retention, even in tight spaces. This in turn allows Ajax’s other players time to make runs into space. His control of the ball is so good that discussions have ensued regarding his long-term potential as a central attacking player. Though Ten Hag has experimented with using Neres centrally this season, his is still best suited as a right-winger. Defenders struggle to keep up with his quick lateral movements. Although David Neres isn’t as explosive as other top-tier wingers, he uses his sublime movement on the ball to work his way around defenders. Neres is more than a dribbler, as proven by his goalscoring record. The Brazilian is a great all-around player in the box. He’s able to position himself in dangerous positions, make intelligent decisions, and put the finishing touches on an assists. Neres also contributes to the defensive side of the game, which is something we will explore in greater detail later. Overall, Neres is a polished star with extremely good footwork and ball control. The question of his ceiling needs to be further examined, though, and that’s exactly what we will do today. David Neres, contrary to most wingers, does not rely on his speed to produce chances. Unlike his domestic rival Hirving Lozano, Neres is a much more technically-disposed character. His lack of blistering pace may hinder the youngster as he eyes an international spot for the Seleção and, perhaps, a bigger club. However pace isn’t everything when considering the brilliance of a wide player. Neres has made a name for himself with his quick horizontal cuts and shifty dribbling. David Neres has started on the left or centre in many matches this season, but he is able to use his strengths best on the right flank. Against Bayern, we can see the Brazilian run at his marker before bursting past Franck Ribery. The premise of a successful David Neres is productive one-on-one dribbling encounters. Vice-versa, Neres looks flat if he can’t manage to trick his marker into a defensive falter. Ajax are a team full of individuals who mix their own talents with intelligent team play, but the attackers rely on the former more often. Against lesser teams, the individual brilliance of someone like Neres is vitally important. Breaking down a back five or a deep block requires a nifty touch. Beating a more daunting opponent, like Bayern Munich, requires that specific skill in addition to intelligent attacking and defending movements. Neres can do both, although isn’t fully consistent in his application. Opposing coaches arm their players with the simple facts: David Neres will run at you, try to fake you, and dribble past you. If he is able to run at a defender and cut onto his left, Ajax are golden. Neres can pick out a pass with ease due to his teammates’ spatial awareness, or he can continue his run. If he cuts on his right, the result is often Neres sprinting towards the byline and crossing into the six-yard box. This is not as effective as a move onto the left foot but is still a viable option. Neres’ reliance on his left foot may be obvious to the naked eye, but it doesn’t seem to affect his choice of dribbling route often enough to be a concern. This was all Neres was really known for when he first joined Ajax. He attacked the box without mercy and hoped that the defender guessed wrong. Often this strategy worked, but losing the ball by dribbling isn’t quite the Ajax way. We’ve seen Neres adopt a far more measured approach in recent matches, with his pausa and calmness taking centre stage. He still dribbles at his opponents but doesn’t force the issue. 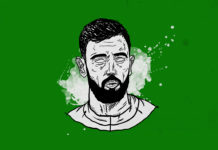 A common sight is Ajax’s number seven surveying the situation as a defender closes down, his legs spread horizontally over the ball, waiting for the last possible second to make a decision. Neres’ goal isn’t always to dribble at a defender to create space. Ofte, his presence commands a second defender, in which case he can find the open man and put Ajax in a better position to score. Speaking of horizontality, David Neres is the king of it. What I mean by this is his movements on the ball; he often dribbles not to beat a defender, but to get closer to his teammates. For example, if Hakim Ziyech passes to Neres out on the right flank – behind the opposing midfield line but yet to break past their defence – Neres may choose not to dribble right at the defenders. He may work his way inside, on his left, in a roundabout run that doesn’t immediately threaten the opposition. Instead, the Brazilian is given a better line of sight to pass to Frenkie de Jong, who is in turn better positioned atop the box to deliver a deadly pass. Eric ten Hag’s allotment of tactical freedom has influenced many things, including the positioning of David Neres. Not only has Neres continued to shape and improve his playing style, but his actual position on the pitch is much more fluid. In both matches against Bayern Munich, he started on the left wing with Ziyech on the right and Tadić as a false nine. It was interesting to see how he interacted with his teammates on his unfavoured flank. Neres often positioned himself in the left half-space, something he does frequently on the right as well. It was a very fluid role, though, as he was pinned up against the sideline one minute and roaming around the centre the next. Ten Hag would even instruct Neres to switch flanks at times during the match, which is a great way to flummox an opposing defensive strategy. What makes Neres capable of these switches is his build as a player. His low centre of gravity and extremely tight control of the ball is optimal for high-intensity defensive pressing. Like his teammate Frenkie de Jong, Neres can twist and turn out of trouble with minimal risk of losing possession. The winger can take more risks with his dribbling and try to create chances by moving into the box, something that midfielders like De Jong don’t have the luxury of doing. David Neres is best known for his skill in the final third, but this picture shows how much he can be involved in Ajax’s midfield passing. Often Neres will pop up in the space in which he’s most useful, such as the right half-space. David Neres isn’t always in and around the box. His ability to drop deep and form passing triangles in midfield is a commonality with Ajax (and some Dutch) wingers. Tadić does this frequently, as does Ziyech when placed out wide. Neres adds a dynamic makeup to this role because he also possesses the threat of running at the defence after linking in midfield. The art of defending is certainly not a lost one, like many football fans will incorrectly lead you to believe. This has never been truer with regards to European clubs’ attacking players, as the work rate required of them is immense. David Neres epitomizes the modern nature of defending attackers, in both a proactive and reactive sense. Classifying defending as either proactive and reactive is somewhat, well, reactive. But I believe they are good blanket terms to describe the defending which is either imposed upon the opponent (pressing high: proactive) or done to stop or contain an already completed move (bodies in the box: reactive). Ajax are certainly a proactive team when defending, especially against teams domestically. But there is always some reactive defending to be done, even if we don’t necessarily notice it. Going to work at the Ajax training grounds is like going to school on how to out-maneuver your opponent in every aspect. Neres was surely forced to come out of his defensive shell when he made the move from Brazil, as Ajax pride themselves in quickly winning the ball back. He is athletic enough to play a part in a high press. Against Bayern, he showed this by pressing the backline constantly and making runs at the keeper when Nico Kovac’s side passed backwards. Neres’ reverse pressing helps to contain the opponent’s counter-attacks. If Ajax’s defenders can stop the ball initially, the retreating run of Neres can help to suffocate the ball and, hopefully, initiate the process of Ajax winning the ball back. What I want to specifically highlight is David Neres’ reactive defending. Not many attackers will run back to help their midfield defend a marauding opponent, but he does. Against AEK Athens, there were many examples of the attacker running back to provide that necessary pressure on a dribbler in midfield. Ajax commit their full-backs forward when attacking, so this added defensive cover is very important when faced with a counter-attack. It is worth watching out for this against Real Madrid. David Neres came to Amsterdam with a €12 million price tag and hopes of joining a top European club in the future. To this point, it’s fair to say the future Brazilian international has lived up to his billing both on the stats sheet and from an analytical perspective. He is able to consistently beat defenders on the dribble, the most important job of a winger trying to get into the box. 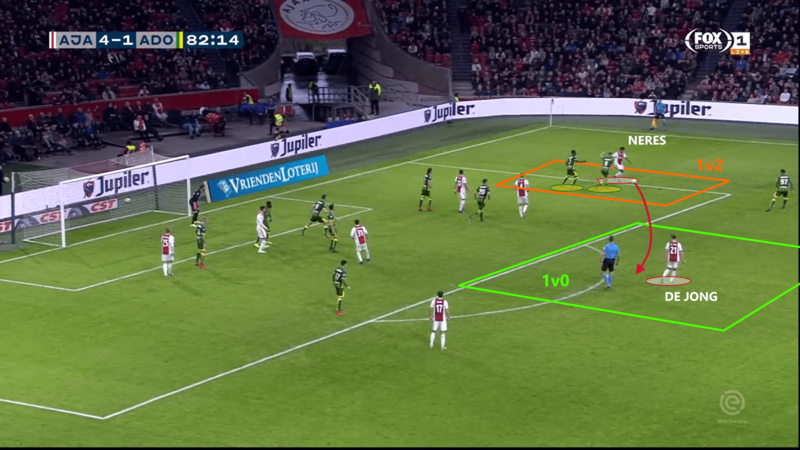 His creation away from the box, and with an eye of moving laterally instead of vertically, often goes unnoticed but is crucial when Ajax want to maintain possession. 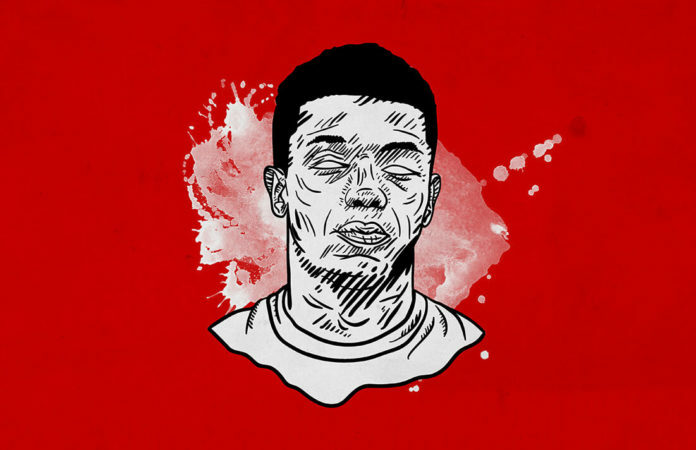 Whether his lack of pure physicality will limit his ceiling at the top level is still up in the air, but one thing is certain: David Neres is one of the most technically gifted attackers in the world at under-21 level. His lessened playing time is more a product of Ajax’s successful summer transfer market than of a downturn in the Brazilian’s performances. Neres isn’t completely ready for his career-defining transfer, but he is polished enough to risk a big move sooner rather than later.